Entdecken Sie die herausragenden Sehenswürdigkeiten in den zum UNESCO-Weltkulturerbe gehörenden Dolomiten während dieser unvergesslichen Fahrt entlang der Großen Dolomiten-Straße. Lehnen Sie sich zurück und entspannen Sie sich, während Sie durch atemberaubend kurvige Bergstraßen fahren und das beeindruckende Panorama genießen. Zu den wählbaren Fahrtpausen gehören ein Spaziergang am See, ein Blick in ein Luxushotel aus dem 19. Jahrhundert, eine Seilbahnfahrt in große Höhen und ein traditionelles Mittagessen im Grödner Tal, einem malerischen Skigebiet. I went to Italy with my partner to celebrate my 50th birthday. We started our trip in Trento, the city my great-grandfather was born. I did not know what to expect, but I knew that there is so much history in the area. We decided to do this day tour to Dolomites with Alessandro and for me it would be just another full day of beautiful sites to visit. But, I was wrong. Alessandro is not just a tour guide. He knows how to take you to another level, making your experience unique and unforgettable. This private tour was one of the best experiences of my life. Alessandro was 100 committed to make us enjoy every single site, town, and historic places we visited. He took us to unexpected gorgeous places like the Rosengarten lake. Being there was like watching a live artwork made by Mother Nature incredible views from different angles of the very blue lake with the Alps in the back. Alessandro historic knowledge is unprecedented and beyond any expectation. I have been in many beautiful places around the world, but Alessandro is such a great guy that made Dolomites tour our favorite experience ever. We were so exited about what we saw and what we learned through Alessandro that we will definitely come back for another tour with him. 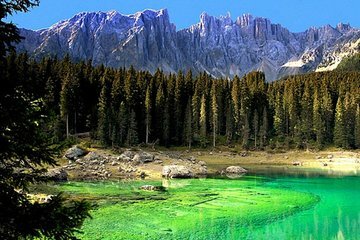 The history of Trentino area and Dolomites is already rich and beautiful, but it is only one of a kind experience, very unique, with the right tour guide. I recommend Alessandro 100. Thank you Alessandro for such a great time.